You can add rules and modifiers to your search using the Search Wizard, and remove them if needed by clicking on the X next to the row containing the item. In most cases, Media Center applies the search to your entire Library. Rules are how you "limit" the results to only the particular files you'd like to see in the resulting list. For example, if you create a Smartlist without any Rules (and no limiting modifiers) then it will always result in displaying every single file in your Library (regardless of Media Type or any other characteristic). Some searches, such as the Search Box, apply the search only to the files already visible in the current View (taking any active filters in the View into account), and in these cases, the search rules further refine the results. Once you add a rule, you will have a new row for the Rule. 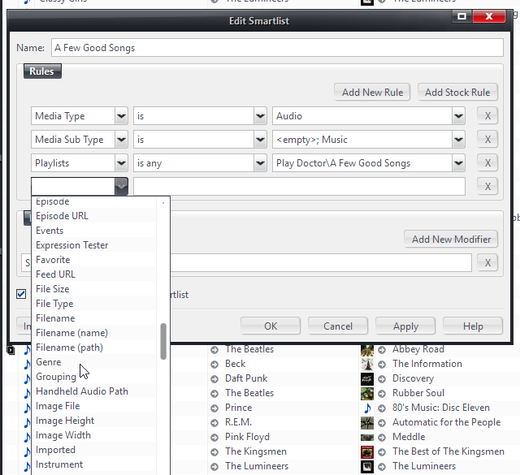 The drop-down box on the left-hand side allows you to choose from all of the Library Fields you have available in Media Center. This will be the particular type of metadata that you will be searching for using this Rule. Choose a Library Field to start making a new rule. The center box is context sensitive and only shows choices that make sense for the type of Library Field you chose on the left. Lastly, once you choose a comparison type, the box on the right allows you to choose what values to search for (or exclude). This box is also context sensitive, and conveniently, it filters the possible results using your actual Library data, and also filters out items that would already be excluded by previously added Rules. Adding a Date Imported rule to a Smartlist. Occasionally, when required, a fourth box will be added to allow you to pick timespans and other similar "types" for your entered value. You can layer Modifiers to achieve various effects. Once you've defined a few Rules that limit the results of your search to less-than the entire contents of your Library, you can use Modifiers to further limit, sort, order, or rearrange the results. Much like adding a Rule, to add a new Modifier you click the Add New Modifier button, which creates a new "row" in the dialog. There are a wide variety of Modifiers that can be used and combined to create powerful and flexible searches. For further information, refer to the Search Language article. The Import/Export button in the Search Wizard opens a dialog that allows you to type the query for the search in using Media Center's Search Language. This allows you to easily copy and paste text into the box to allow you to quickly import searches from other users or locations. You can also save and load the rules from text files. When you enter a search using the Import/Export button and then return to the Search Wizard, it will update itself to reflect the new search, and then you can use the Wizard to modify it further if necessary. Rules and Modifiers are evaluated from top to bottom in the list. If needed, you can further refine the search manually by clicking the Import/Export button and using Media Center's Search Language. 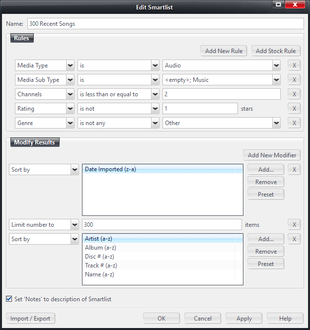 The Import/Export dialog will load with the current contents of the Wizard translated into the Search Language. And, when you close the Import/Export dialog, it will again convert the results into the Search Wizard. Remember, if you do not exclude a particular result with a Rule or Modifier, then all files in your Library will end up in the resulting list. Try adding Rules first, and then look at the results. Only after you have a good "working set" of files should you add the Modifiers. This ensures you understand what the total set of possible results will be before you limit or shuffle them.